The other day I thought about what to make for Autumn. My mind wandered around my kitchen and what type of tools and things I have there. I know there a bunch of things for Halloween, but I am not there yet. However, I wanted to make something, something that’s not pie for that matter. Finally, I remember that I have leave cookie cutters, as well as a pumpkin and acorn. 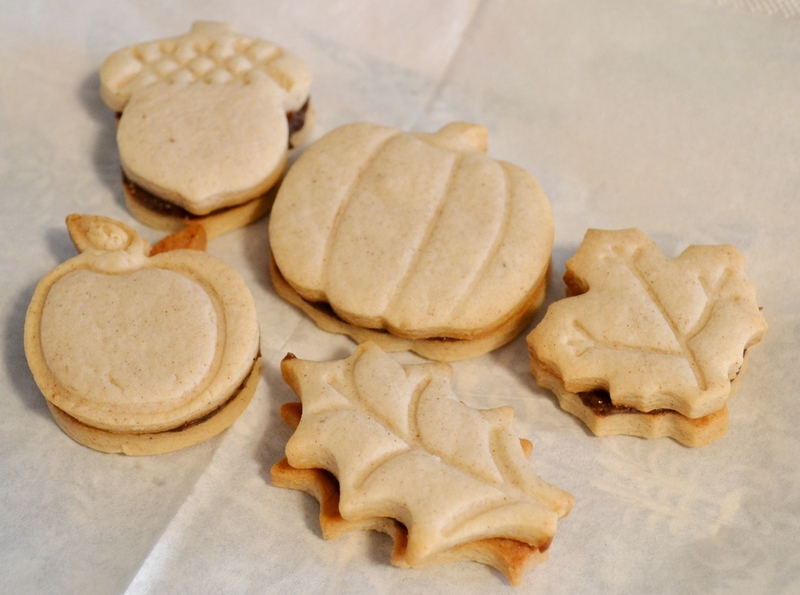 They are originally for pie but great for cookies too. Now all that I had to decide for was a recipe. 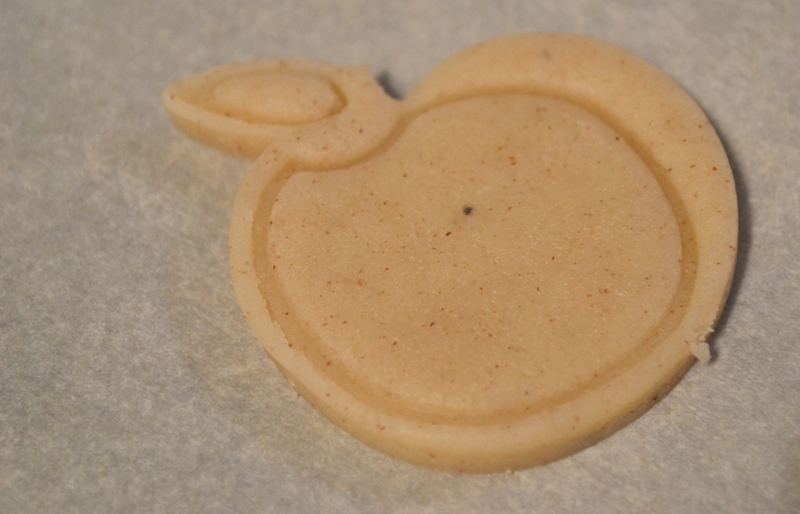 I thought of spices and pumpkin and that it would be nice to have that in a cookie. 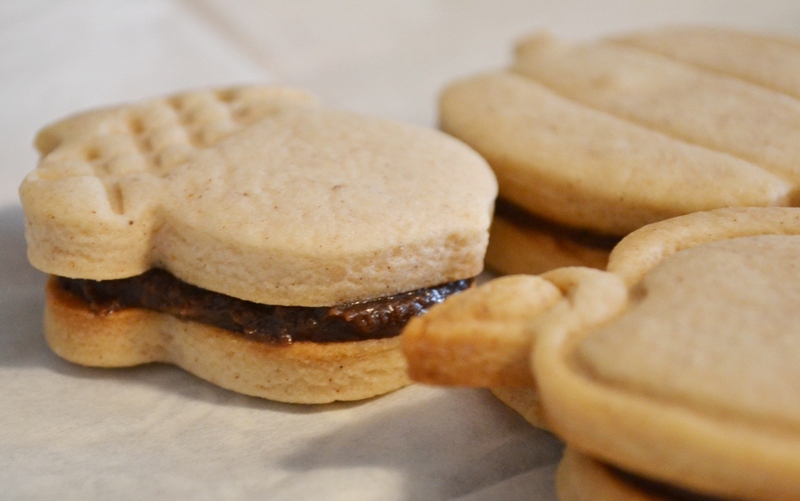 Also, I wanted to make sandwich cookies, don’t as me why, I just had it in my head and wanted to do it. So I googled sandwich cookies but nothing that popped up was close to what I wanted. Finally I checked my cook books and came a cross a basic Roll Out Cookie recipe, this plus pumpkin spice added and I was happy. Measure and mix, store in an air tight container. The recipe comes from Pumpkin Nook. Cream the butter, vanilla and sugar together until well combined, add the egg and mix well. Sift flour, baking powder and spices together. Slowly add to the wet ingredients and mix until well combined. Remove from the bowl and knead quickly on a surface dusted with flour. Wrap the dough in a plastic wrap and chill for a bit. The recipe doesn’t say for how long, I left it in the fridge over night so that the spices could infuse completely. Remove from the fridge and knead again to soften the dough somewhat. Roll out on a flour dusted surface. 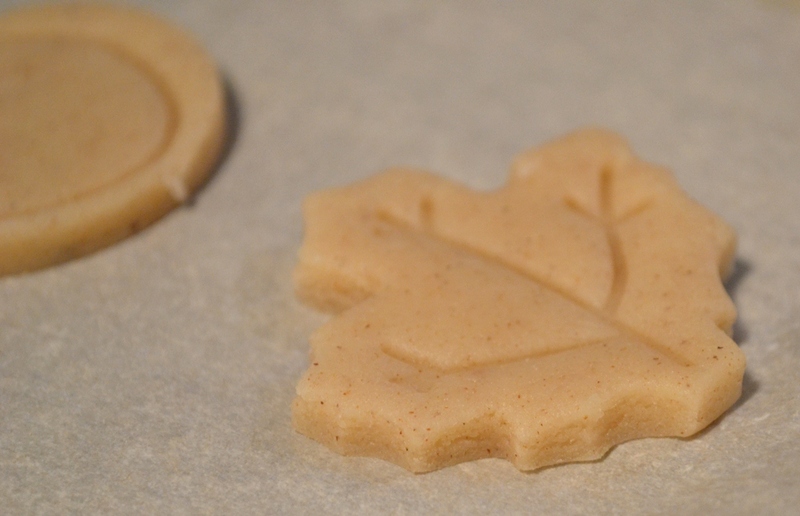 If you have cookie cutters that will imprint details, make sure the dough is thick enough to leave the imprint. Otherwise, roll out the dough as thick or thin as you like. Place on a cookie sheet lined with parchment paper and bake at 200°C for 10 to 15 min or until the edges are lightly brown. Take out of the oven and let them cool on a wire rack. You could eat them as they are, maybe dust lightly with icing sugar. However, I was looking for sandwich cookies, thus I needed a filling. I remembered that I had some Whisky Ganache in the freezer which I took out a day before. 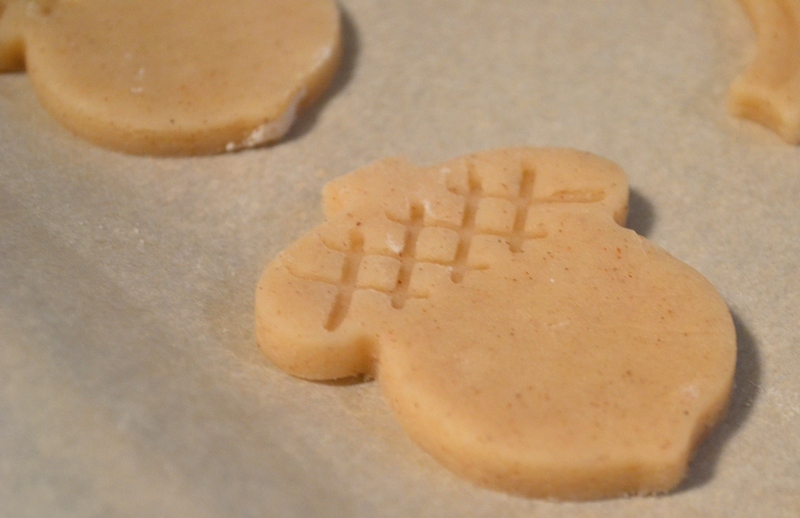 Add a dollop on the underside of the cookie and place a second cookie on it, slightly squeeze, done. I find that sandwich cookies are the prettiest if you have underside on underside. 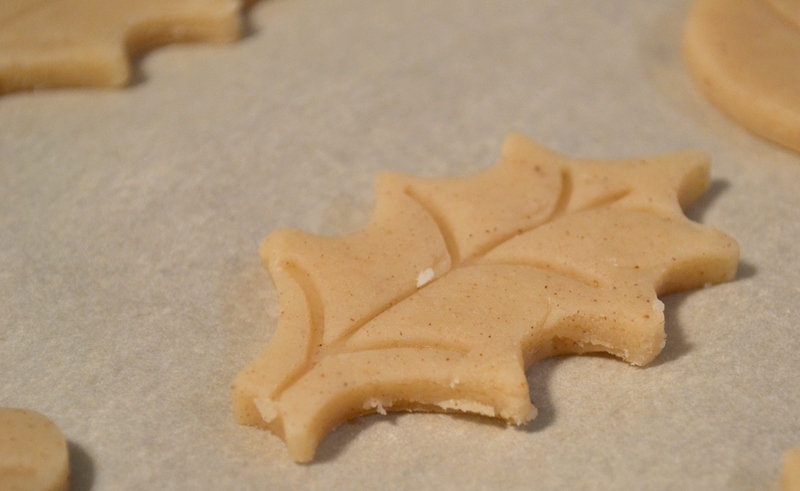 Tip: If your cookie cutter is straight and equal you will have no problem with this. 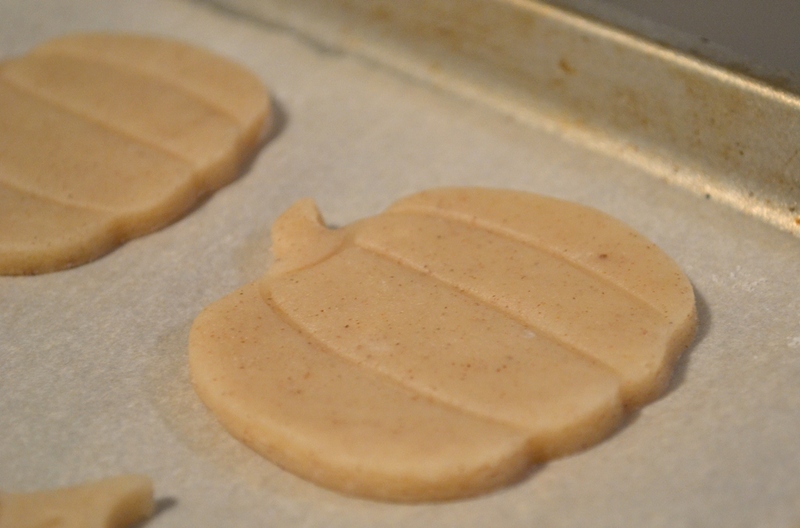 However, if it is bent or has a little stem bent in one way, the you need to flip the cookie cutter. Otherwise it won’t match. See pictures for details. Since I forgot to take the cookies to work I have no idea how they taste, however, I hope they are good. They definitely look cute. Posted in Cookies, Little Treats and tagged Autum, baking, cookie cutter, cookies, fall, pumpkin spice, recipe, sandwich cookies, simple. Bookmark the permalink.